MARTIN SAMUEL of The Times and Mike Hewitt of Getty Images were named Sports Writer and Sports Photographer of the Year at an awards ceremony in London’s West End. In the annual prizegiving organised by the Sports Journalists’ Association of Great Britain and supported by UK Sport and Laureus, Samuel became the first winner chosen by Britain’s national newspaper sports editors, who were asked to cast votes in a Eurovision Song Contest-style poll. He triumphed from a short list which included the Sunday Telegraph’s former England cricket captain Michael Atherton, Paul Hayward and Charles Sale of the Daily Mail, James Lawton of the Independent and the Daily Telegraph’s Henry Winter. Samuel and Hewitt were presented with the John Bromley Trophy and Ed Lacey Trophy respectively by SJA President Michael Parkinson. Hewitt, the winner in 1998, won a close run race with David Ashdown for the top photographic award, though Ashdown, of the Independent and Independent on Sunday, had the consolation of winning the award for Sports Picture and Sports News Picture of the Year for his stunning capture of Andrew Strauss’s Test match catch to dismiss Australia’s Adam Gilchrist. The awards for journalists and photographers have been in existence for more than 30 years but this year the SJA introduced new categories for broadcasters and cartoonists. Sky Sports’ Jeff Stelling was named Sports Broadcaster of the Year for his weekly marathon stint as presenter of Gillette Socccer Saturday, while Channel 4’s Ashes cricket coverage won Sports Programme of the Year, the award collected by Jeff Foulser of Sunset & Vine, the programme’s producers. 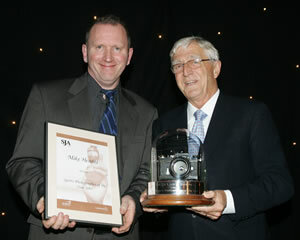 Nick Newman of the Sunday Times was crowned the first Sports Cartoonist of the Year. The awards also recognise quality sports writing in the provinces and the title of Regional Sports Writer of the Year went to Martin Smith of The Star, Sheffield, for the second time in three years. The award for Sports Story of the Year went to the News of the World’s Rob Beasley for his scoop of Chelsea tapping up Arsenal’s Ashley Cole, which won the judges’ vote ahead of Harry Harris (Daily Express) for his exposure of the Glazer family’s takeover of Manchester United. The Daily Mail’s Charles Sale (Sports Diary) and the Daily Telegraph (Sports Team) both regained the titles they held two years ago, in the latter’s case for their Ashes cricket coverage. 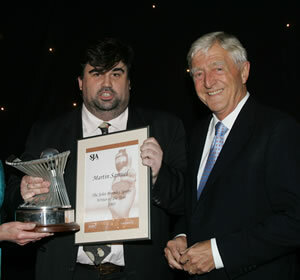 The Doug Gardner Trophy for Services to Sports Journalism was awarded to David Welch, in recognition of his campaign for governent support to bring the 2012 Olympics to London which he instigated towards the end of his 15 years as Daily Telegraph Sports Editor.